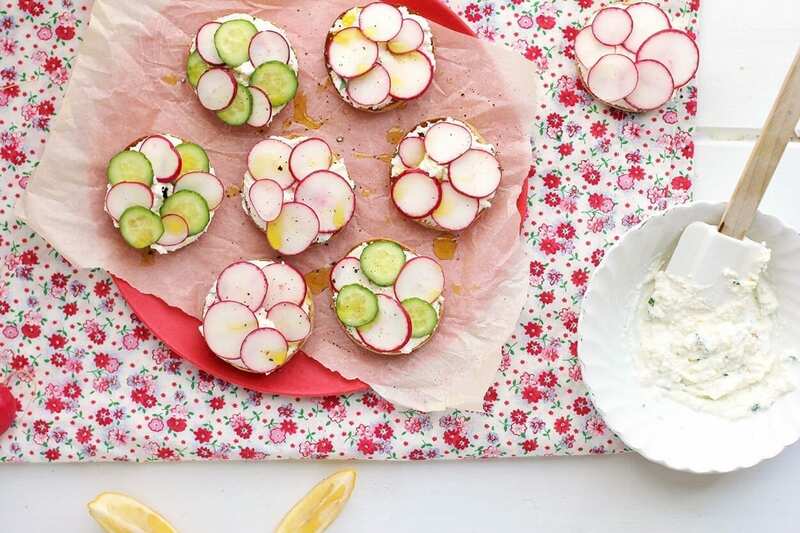 Radishes are not just good for adding a touch of peppery zing to certain salads, they’re actually extremely good for us too. Packed full of essential nutrients, they will silently nourish us while we dramatically spruce up a whole variety of meals and snacks. Though the main attraction we’re drawn to, is the amazing reaction of the respiratory system. 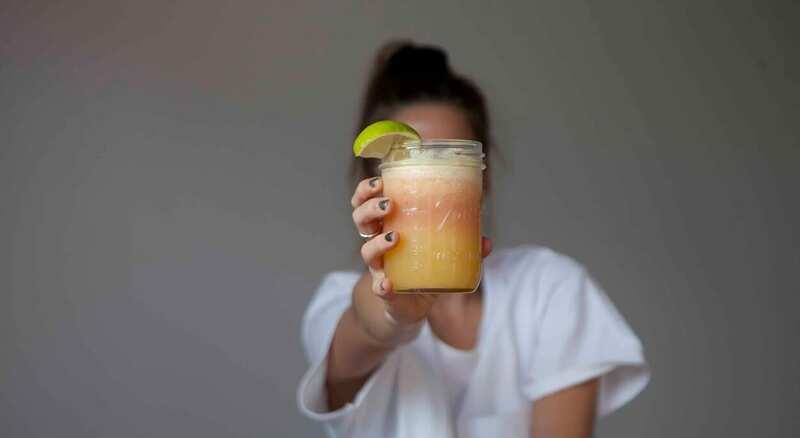 In traditional medicine, radish juice has been used for treating every possible respiratory disorder – sinus issues, bronchitis, asthma, you name it. Compounds within the radish (and juice), have the ability to stimulate the mucous membranes that line our respiratory tracts and work quickly to clear congestion. Once the nutrients have been absorbed, they get to work providing protection against any infection the lungs may be battling. 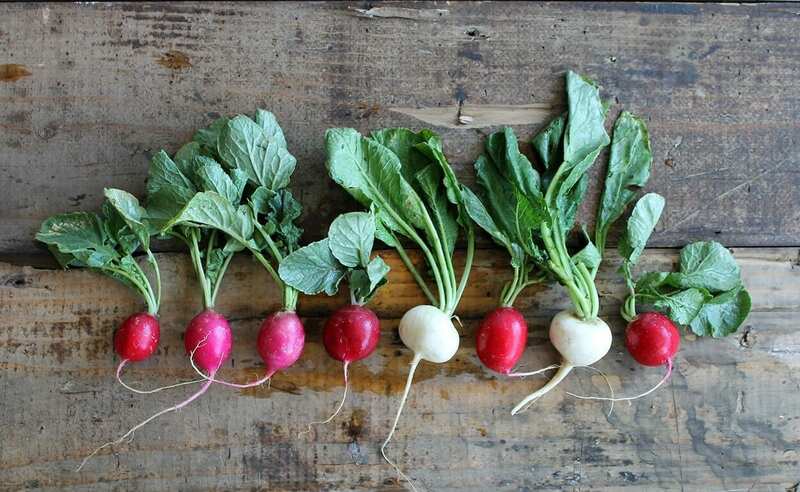 So, if you, or someone you know, is suffering from a chronic cough, runny or blocked nose, has come down with a cold or flu, wakes up puffy-eyed in the mornings, struggles with bad breath or just needs a mental and physical wake-up boost – recommend some radish juice! Heat oven to 400° F (204°C). Place the baguette slices on a baking sheet and brush both sides of the bread with the oil. Bake until golden brown, 4 to 5 minutes per side. 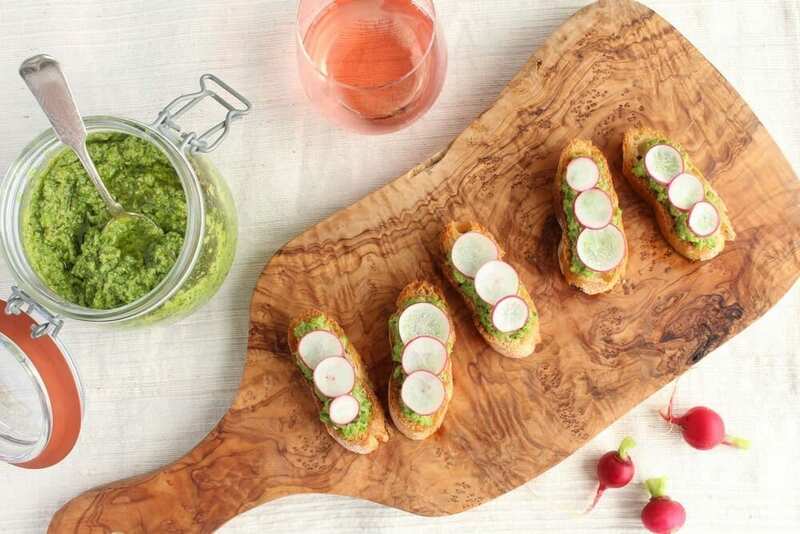 Dividing evenly, spread the pesto on the toasted baguette slices, top with the radishes, and sprinkle with the salt. For this easy-peasy between-meals snack, simply place 1 cup ricotta (preferably fresh) in a small bowl, drizzle with 1 tablespoon extra-virgin olive oil, and sprinkle with 1/8 teaspoon each kosher salt and black pepper. Serve with 2 bunches radishes (about 16; trimmed). You’ve gotta try this quick, nourishing lunch to have at home or take on the go. Starting to step it up a notch with some braising. This is the perfect gourmet-style veggie side for pretty much any savoury meal. Couple it with a smooth glass of red wine and get your chef hats out because this will impress any guest! 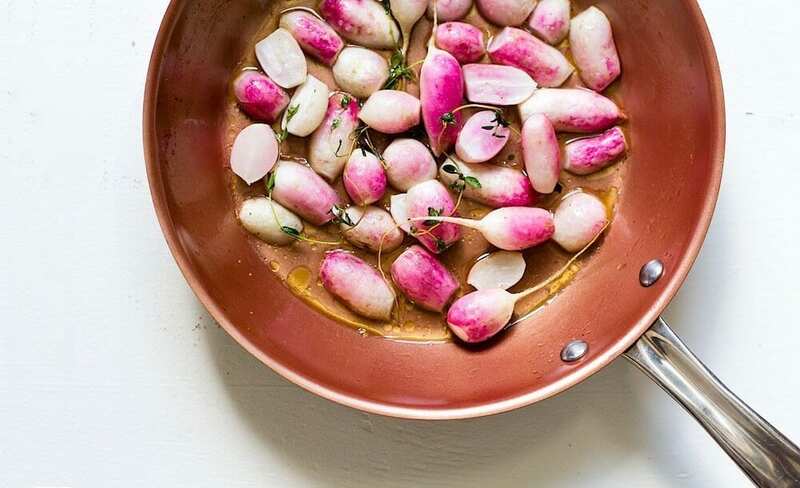 Place the radishes in a large skillet and add just enough cold water to cover, about 2 1/2 cups. Add the butter, sugar, salt, and pepper and bring to a boil. Reduce heat to medium-low and simmer until the radishes are tender when pricked with a paring knife and the liquid has reduced to a glaze, about 12 minutes. 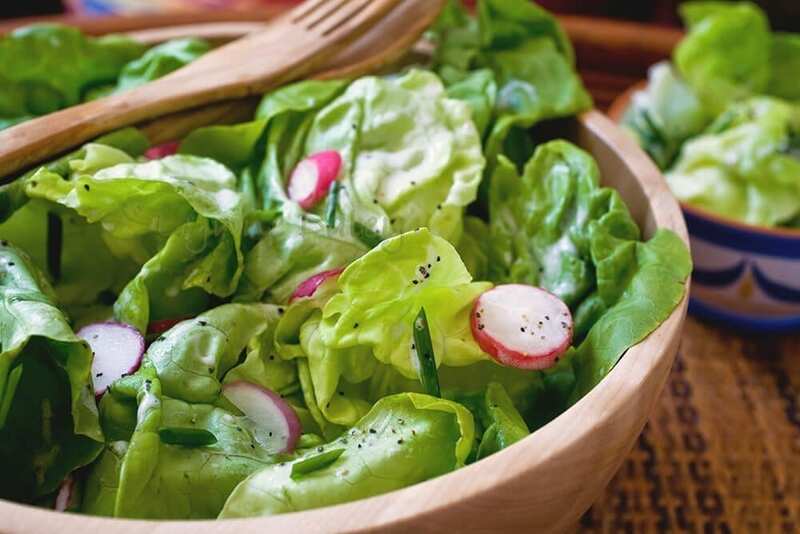 If the radishes are tender but the liquid hasn’t reduced sufficiently, use a slotted spoon to transfer them to a serving dish and continue reducing the liquid. 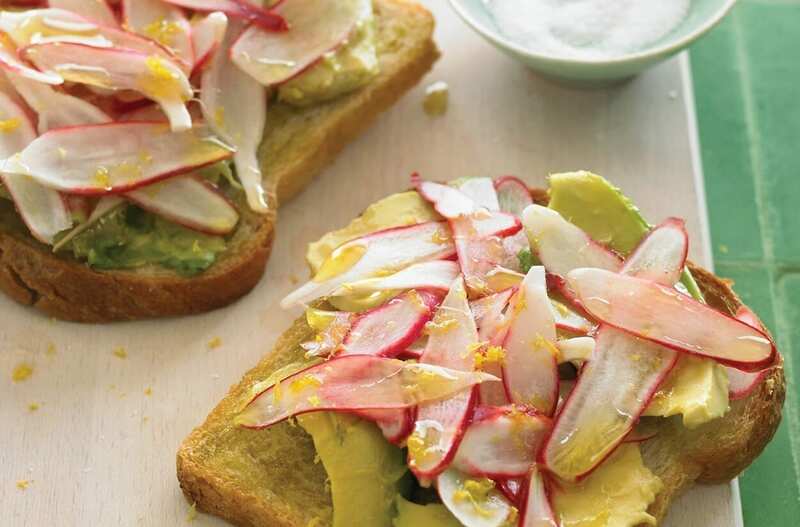 Spoon it over the radishes and serve with buttered crusty bread. Mustn’t forget the side-salad. This one’s a good’un. Heat oven to 400° F. On a rimmed baking sheet, toss the bread with the oil and 1/4 teaspoon each salt and pepper. Bake, tossing once, until golden, 7 to 9 minutes. Let cool. In a large bowl, whisk together the buttermilk, mayonnaise, parsley, garlic, 1/2 teaspoon salt, and 1/4 teaspoon pepper. Add the lettuce, radishes, shallot, and croutons and toss to coat. At the School of Natural Health Sciences you can study to gain an internationally accredited diploma in Nutrition. We offer 3 foundation courses in nutrition: Clinical Nutrition, Child & Adolescent Nutrition and Sport & Exercise Nutrition. We also offer an Advanced Nutrition course for all those that are already qualified. You might be interested in our Nutrition Course Pack which offers 3 nutrition courses at a bargain price!